Over the last week I have been seeing a lot on the internet about something I absolutely love – rhubarb. 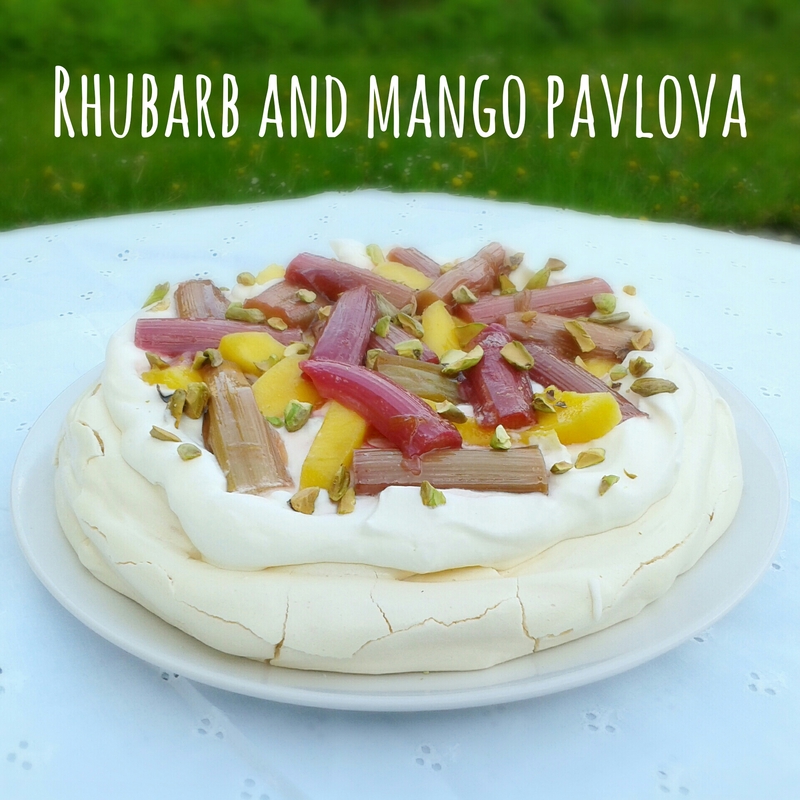 And seeing @KarenBurnsBooth & @FarmersgirlCook tweeting about The Great British Rhubarb Recipe Round-Up* I was inspired to join in with the rhubarb party and create something yummy – a rhubarb and mango pavlova topped with pistachios. This recipe is really summery, I think the sharpness of the rhubarb goes really well with the sweetness in the mango and meringue; the pistachios on top make it extra tasty. Preheat the oven to 100c and line a baking sheet with non stick baking parchment. Pour the egg whites into a clean non plastic mixing bowl and mix with an electric mixer or whisk until the egg mixture forms stiff peaks. At this point turn up the speed and start adding the caster sugar a spoonful at a time, leaving 3 to 4 seconds between each spoonful. It’s important not to add the sugar too quickly as this will make your meringue weep. The mixture will be thick and glossy. Sift the icing sugar into the mixture a third at a time, gently folding it in with a metal spoon as you add each third. Don’t over-mix the meringue as you want to keep as much air as possible in it. The mixture should be smooth and fluffy. Scoop the meringue onto the baking parchment in a circle and bake in the oven for between 1.5 – 2 hours, until the meringue sounds crisp when tapped on the bottom. Leave the meringue on a rack to cool. Cut the rhubarb in to 5cm lengths and place them in an oven proof dish. Sprinkle over the caster sugar. Cover with foil and bake in the oven. After 12 minutes remove the foil and spoon the syrup over the rhubarb until it is fully covered. Bake for a further 5 minutes then remove from the oven and test with a knife. The rhubarb should be soft but not mushy. If it is to hard cook it a further 2 minutes and then test again. Repeat this process until it is cooked then set aside to cool. Once everything is cool, whip the cream. Spoon the cream on top of the meringue then top with the mango and cooked rhubarb. Top the pavlova with the crushed pistachios and enjoy. The leftover syrup from the cooked rhubarb is awesome in a mojito. LOVE – So much love. the best things in the history of cooking combined, and the pavlova is so pretty, really. I am so delighted that you saw the Great British Rhubarb Recipe Round Up on Twitter and have made this gorgeous pavlova to join in. Thank you so much. Thank you! I love rhubarb so enjoyed the challenge. 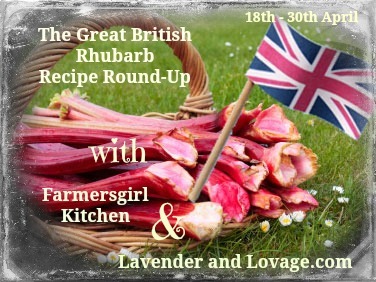 All the rhubarb recipe links on your website look amazing.